Billy removes the last of the collapse from the later annex at the entrance to Structure Twelve. Today is nice and sunny at the Ness. We appear to be in a little bubble of brightness, with dark and angry clouds lurking on the horizon, but keeping their distance. In Structure Ten, however, there is a little less cheeriness and a good deal of head-scratching. The problems associated with that massive building are proving to be both complex and extensive. Mike has now defined the robbing out of the original south-west corner and the interior structure has been confirmed as being square in plan. So far, so good — this now allows for the final removal of the dressers and the defining of the floor deposits. It has been argued, and accepted, that there are two major phases associated with the structure interior — the cruciform and the square. Now there is a potential need to insert a third phase between the other two. This has come about because of the manifest instability of major sections of the building. Dan and Andy collecting floor samples in Structure One. The slumping effect brought about by the earlier structures underneath has resulted in a filling of concavities and the re-laying of certain sections of floor, all in the name of keeping the floor level. This is what may constitute the third, intermediate phase. To complicate matters further, elements of the previous buildings under Structure Ten, such as individual stones and sections of walling, have been incorporated into the later structure. All in all, when sampling of the floor deposits begin, it will be excruciatingly difficult to pick out which bits of floor to sample and to assign those samples to definite phases, rather than to emergency patching and filling. The team in Structure Ten have done wonders thus far, but there is a suspicion that their real problems may only just be starting. The work in Structure Eight has been almost as difficult. Underlain by the earlier Structures Eighteen and Seventeen, the south end of the building has been a morass of deposits and earlier stones, confusing attempts to define elements of Structure Eight and to discern an acceptable sequence there. Dave and Jane unravel Structure Eight — the new hearth can just be seen behind Dave. However, Dave and Jane have made great strides today. Dave has discovered another hearth, although most of it is underneath the midden baulk, which contains the pesky water pipe [a modern day water pipe runs right across the Ness of Brodgar excavation site]. The actual floor deposits have also now been revealed, making it possible to deal with the whole of Structure Eight as a single entity and giving a much more full and comprehensive picture of the building and, potentially, the activities which took place there. Elsewhere on site there is a good deal of giggling and smiling, happy faces – the Excavation Club has returned. 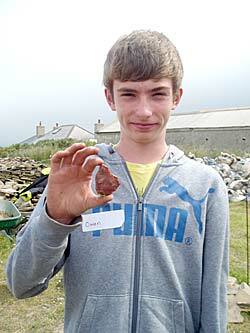 Owen, one of the Excavation Club, with his large flint flake. Fourteen delighted youngsters are here, shepherded by Helen Woodsford-Dean and Historic Scotland rangers Sandra, Elaine and Keith, together with the mystery ranger. They are being helped with trowelling and the recovery of pottery, bone and stone. All of them want to return. After all, it’s fun getting dirty, but even more fun to find something which nobody else has touched or seen for nearly 5,000 years. More than one person said: “ You know, that fellow looks just like the Rev Fraser MacNaughton, from St Magnus Cathedral. And indeed it is he. Fraser is a part-time ranger and his presence here is strangely apposite. A beautiful sandstone block from one of the dressers in Structure Ten was traced to potentially the same source as the sandstone in the cathedral. In that sense, Fraser has come back to his roots. Heads down there must be something interesting here! 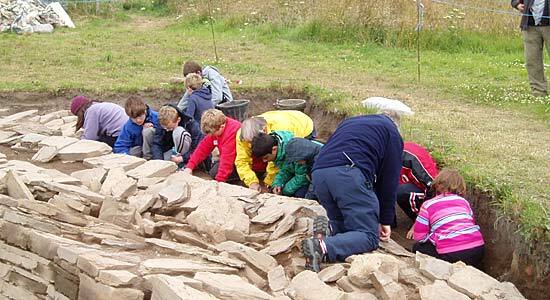 — budding archaeologists at the Excavation Club. Garnet, assisted by Prof Scott Pike, undertake some background XRF readings inside Structure Ten. I am a senior archaeology major and biology minor at Willamette University in Salem, Oregon, and today is the second day on site for all of the Willamettes — except me and one other who excavated here last year. 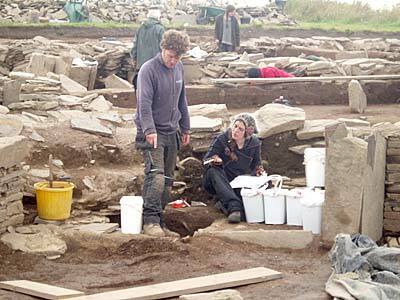 It was so amazing, that I have returned for a second year at the Ness of Brodgar, and I brought my family. We arrived in Edinburgh on July 12, then we worked our way up through the Scottish mainland, touring fascinating sites as we went. Then, on the 18th, we boarded a ferry in Gill’s Bay and rode to St Margaret’s Hope, Orkney. My family was amazed at the density of archaeology on these small islands. We visited the Brough of Birsay, the Broch of Gurness, St. Magnus’ Cathedral, the Bishop’s and Earl’s Palaces in Kirkwall, another related Earl’s Palace, near Birsay, the Fossil Heritage Center, the Orkney Museum, the Ring of Brodgar, the Stones of Stenness, Cuween Cairn, Skara Brae, and a few other sites whose names I cannot spell. 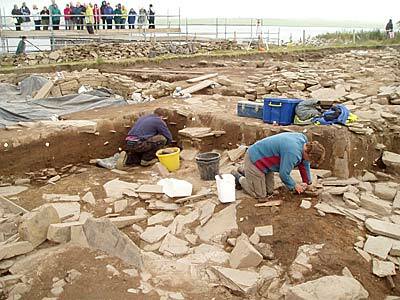 We ended with the Ness of Brodgar, where my family toured the site, then left, leaving me to my work. This year, in addition to excavating in the trenches, I will be working on my senior project. With the help of my professor and the other professionals here, I will attempt to identify the sources of pigments which have been found here at the Ness. This will include gathering samples of galena and haematite from around Orkney, then analysing their composition in an attempt to find a conclusive match to the pigments that were used here. 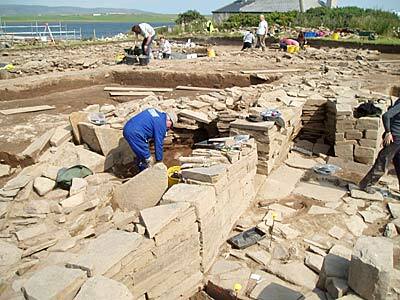 I am excited to begin my project, and hope that it will contribute to our understanding of the Neolithic peoples of Orkney.